Takin' Care of Bizness, pure and simple. Their song, "GO BIG PAPA!" has been used in the national television ad campaign by Papa John's Pizza for the past two years and has been licensed for a third. It even appeared during the Superbowl! They have also recently had two songs appear in the hit A&E TV series, BREAKOUT KINGS. CHRIS THAYER AND THE TCB has also garnered several awards. They won "Best Song" and "Best Blues Album" at the 2008 Inland Empire Music Awards for their second CD, 12 GAUGE INSURANCE PLAN. Their first disc, NICE 'N' GREAZY, won three 2007 Inland Empire Music Awards, including “Best Live Band,” “Best Blues Album” and “Best Song." Likewise, they were nominated for Best Swing in the 2008 Orange County Music Awards. Leading this rag-tag bunch of ruffians is CHRIS THAYER, working the mic and cuttin’ heads on the six string with a ferocious blend of styles, including Louis Jordan, Albert Collins, and Robert Cray. Layin’ down the low stuff, nice ‘n’ cool, is blues veteran STEVE BROWN on bass. HEBIE CASTRO is the glue that holds it all together on the skins with steady grooves and dynamic rhythms. The attitude is provided by MAURICE OLIVA on tenor saxsophone. JOHN MILA DE LA ROCA on keys rounds out the sound with driving rhythms that hit you like a freight train. 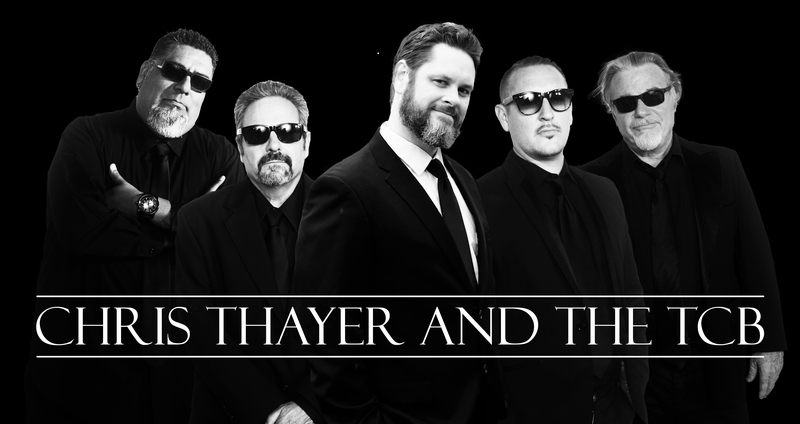 Formed in 2006, CHRIS THAYER AND THE TCB have taken audiences by storm, “Resurrecting Cool” all across the Western US with their mixture of jump blues, rock and swing. They have shared the stage with blues legends like Robert Cray, Johnny Winter, Big Bad Voodoo Daddy, Tommy Castro, Coco Montoya, Fabulous Thunderbirds, James Hunter and Rod Piazza & the Mighty Flyers. Their latest CD, LET YOUR HAIR DOWN, mastered by Grammy Award winning mastering engineer, Robert Hadley of the Mastering Labs, is high energy set featuring 12 new recordings, including the local fave, "Tattoos and Jello Shots" Previous releases include SIX PACK OF COOL, DANCE WITH THE DEVIL, BUCKSHOT LOVE: LIVE FROM THE RHYTHM LOUNGE, 12 GAUGE INSURANCE PLAN, and NICE 'N' GREAZY. In addition to a two year sponsorship from Sam Ash Music, CHRIS THAYER AND THE TCB have signed endorsement deals with Heil Sound Microphones, Furman Sound and Levy’s Leathers Guitar Straps. CHRIS THAYER AND THE TCB is the music you hear echoing off the brick walls of the alley as two tough guys begin acquainting your knee caps with "Mr. Lead Pipe."